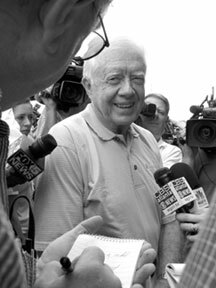 Plains friends greet Nobel-winner Carter: Former President and the newest Nobel Peace Prize recipient Jimmy Carter makes his way through reporters following a press conference, Friday, Oct. 11, in his hometown of Plains, Ga. 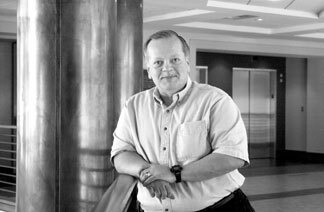 The 78-year-old Carter had been notified at 4:30 that morning that he was to receive the prize.”I am delighted, humbled and very grateful that the Nobel Prize committee has given me this,” he told a crowd of about 200 gathered in front of the Plains antique mall. Many of the onlookers were old family friends, several of whom he thanked by name. Click here or above for the full story. Photo by Emily Howard. Scholarship & Research: Gould explores the mathematics of games, gambling: Ronald Gould, Goodrich C. White Professor of Mathematics, is teaching a freshman seminar this semester on “Mathematics in Games, Sports and Gambling.” In the class, he points out to students how the laws of probability govern what are sometimes thought to be games of chance, as well as the role statistics play in our understanding and appreciation of sports. Click here or above for the full story. Photo by Ann Borden.